Kitely Market is now open for business! Kitely Market is a virtual goods marketplace that will create a unified market out of all the separate grids that make up the Hypergrid metaverse. This will enable content creators to make serious money, while setting up only a single web-based store. This is an ambitious project that we’ve been working on for more than 6 months, and we are very happy to finally be able to let you use it. When we designed Kitely Market we had several examples in mind. First, we know that most users of virtual worlds are familiar with the Second Life Marketplace, since it’s the largest and most successful market for virtual goods. 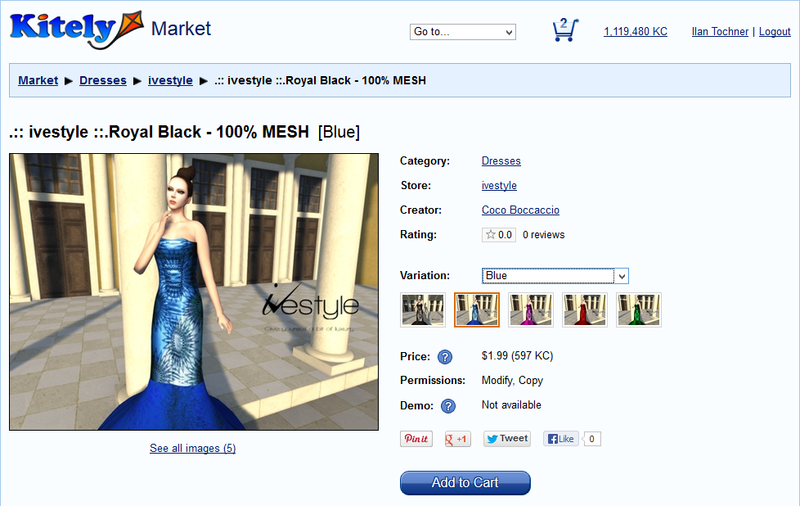 We therefore started out by making sure that Kitely Market will look familiar to people coming from Second Life. For example, we arranged products in a Categories tree that has a lot in common with the one used in Second Life. However, we didn’t stop there. Our goal wasn’t to copy the Second Life Marketplace — it was to create something better. So we continued by adopting some good ideas from popular e-commerce sites such as Amazon. For example, we use Attributes to make it easier for you to find the products you want (we talk more about attributes later). And finally we added some features that we haven’t seen anywhere else, because we do occasionally have original thoughts :). The basic operation of Kitely Market is similar to existing virtual goods marketplaces. Merchants create Product listings using items in their inventory. Users browse the products and purchase them. Bought products are delivered directly to the buyer’s inventory. 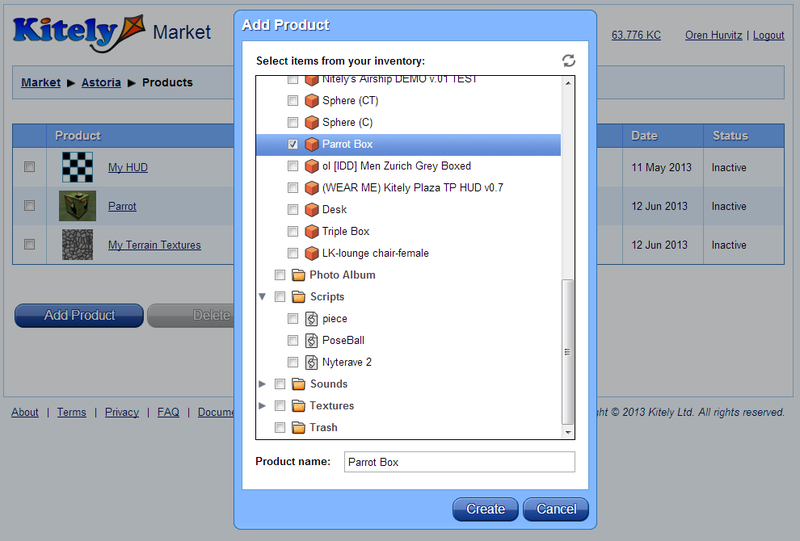 Categories and Attributes are both ways to search for items in Kitely Market. Each item belongs to one category: for example, Shirts or Musical Instruments. Each item may furthermore have many attributes. For example, a shirt may have these attributes: Color (red/blue), Department (men/women), etc. When you search for items you can search by any combination of text, category and attributes. The following screenshot shows a sample search. In this example the user searched for products that have “mesh” in their description; have the “Black” Color attribute; have the “Modern” Theme attribute; and are sold with the “Modify” permission. The left side of the screen shows the currently selected filters, and the categories where matching products were found. You can click on these categories and attributes to further refine your search. The use of Attributes makes it easier to find items than when only Categories are available. 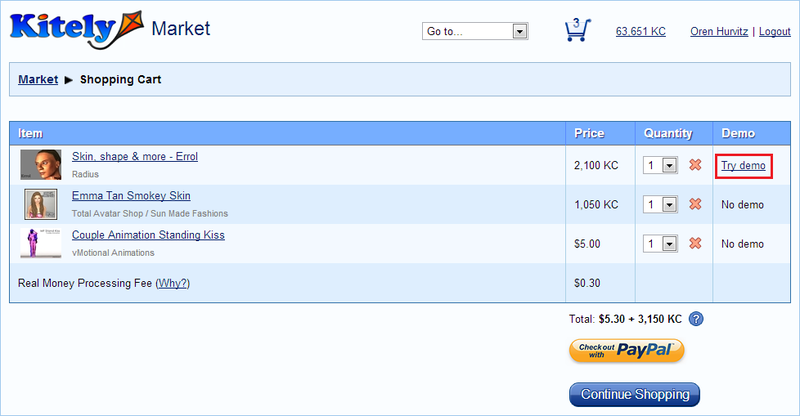 It also reduces the number of Categories, which again makes it easier to find the items you are looking for. For example, the Second Life Marketplace includes several similar categories such as “Rings”, “Jewelry Sets”, “Valentine’s Day Jewelry” and “Wedding Rings”. This makes it difficult to find all the jewelry items because you have to look at each of these categories separately. And if you want to see only gold jewelry then you’re out of luck: you have to scroll through all the items in these categories. In contrast, Kitely Market makes it very easy to perform such searches. First, Kitely Market contains only one relevant category, called “Jewelry and Watches”, so you only have to search there. The reason that we can do this is that we’ve moved some of the categories used in Second Life into attributes. For example, we have attributes for Occasions (“Valentine’s Day”, “Wedding”). Furthermore, you can specify the attribute “Color: Yellow” in order to see only gold jewelry. A product may have several Variations, which are small differences in the product. For example, a merchant that creates a blouse might offer it in five different colors. Other marketplaces present these blouses as five different products, which makes it difficult to compare them, and also takes more work for the merchant to maintain. Kitely Market enables the merchant to create a single Product with five Variations. All the variations are shown together, and the user can easily compare them. The screenshot above shows an example of a dress that is available in five colors. You can view each of the variations by hovering the mouse over the variation’s thumbnail. This is really cool, so here’s another example, and another. Variations make it easier to search for products, because when searching the marketplace the product will appear just once instead of five times. The variation that appears is the one that matches your search filter best. For example, here’s a search for outdoor chairs. If you click on different Color attributes then you’ll see the same product (Adirondack Chair Set) appear only once each time, with the color that you selected. All of the product’s variations are counted together for the purpose of reviews, sales ranking, and Likes. This means that combining similar products into a single product with variations can help increase that product’s search ranking, and thus help it sell more. This also lets buyers see all the relevant reviews for the product at once. Each product variation can have a demo version. Unlike in other marketplaces, this is not a separate product: the demo is an integral part of the product. Potential buyers can easily try the demo version as follows: they add the item to their Shopping Cart, and in the cart they get a link called “Try demo”. When they click this link, the demo version is immediately added to their inventory. At the risk of sounding immodest, we believe that Kitely Market has the best user experience of any web-based e-commerce marketplace currently out there! Seriously, check it out. Kitely Market has been open for merchants (but not buyers) for several months, in order to allow them to add products to the market before its grand opening (today!). We want to thank these early-birds who added products to the market before they could actually sell anything: they created almost 1000 variations in total, and they’re the reason you can experience the full power of Kitely Market immediately, without having to wait for merchants to start creating their stores. Two of our merchants have even achieved Featured Merchant status, and their stores are now displayed prominently in the market homepage. Merchants can choose to sell their products for Kitely Credits, US Dollars, or both. When a product is bought using KC we transfer those KC to the merchant immediately (less Kitely’s fee). When a product is bought for USD we hold on to the money for 45 days to get past PayPal’s transaction dispute window. Within a week afterwards, we transfer the money to the merchant’s PayPal account automatically (less Kitely’s fee, and subject to a minimum payout amount). Kitely Market fees are explained here. When merchants sell their items for US Dollars they receive these USD into their PayPal account automatically (after a certain delay, as explained above). Unlike some other marketplaces, we don’t force all purchases to be converted into our grid’s virtual currency. This eliminates a problem we’ve heard from many merchants, that they fear being stuck with a virtual currency that they don’t need, or they just don’t want the hassle of converting it into real money. Kitely maintains anonymity for both buyers and sellers: they each see only the other party’s virtual identity, but not their real-world identity. We’ve already explained in the past how to create a store in Kitely Market, so we won’t repeat that information here. For more details see either this blog post, or our Wiki. Merchants can choose whether their items can be used only in Kitely, or in other OpenSim grids as well. They do so by setting the Export Permission on their products. Products where the Export permission is disabled (this is the default) can’t be taken out of the Kitely grid. Products where the Export permission is enabled may be transferred to other grids. At this time the only way to transfer products to other grids is by rezzing them in a world; exporting the world to an OAR file; and then importing that OAR file in another grid. The next phase of the Kitely Market rollout will enable delivery of bought items to avatars from all hypergrid-connected grids. Once we enable the full power of this feature, merchants selling in Kitely Market will be able to easily provide their goods to tens of thousands of people who actively use Hypergrid-connected grids. Kitely Market contains other features that are standard for marketplaces, such as Reviews, Comments, Rankings, Purchase History, Sales History, Email Notifications, etc. Reviews and Comments show users’ pictures, so we recommend that all users set a profile picture. To make this easy, we now allow uploading pictures directly in the website. These pictures are automatically used in the Kitely Forums as well. We made a small change to the way that we ask users to accept our Terms of Service. This change affects only users who signed-up using Facebook: the first time they login to Kitely, they will be asked to accept our Terms of Service. This doesn’t affect users who signed up using Twitter or Email/Password. 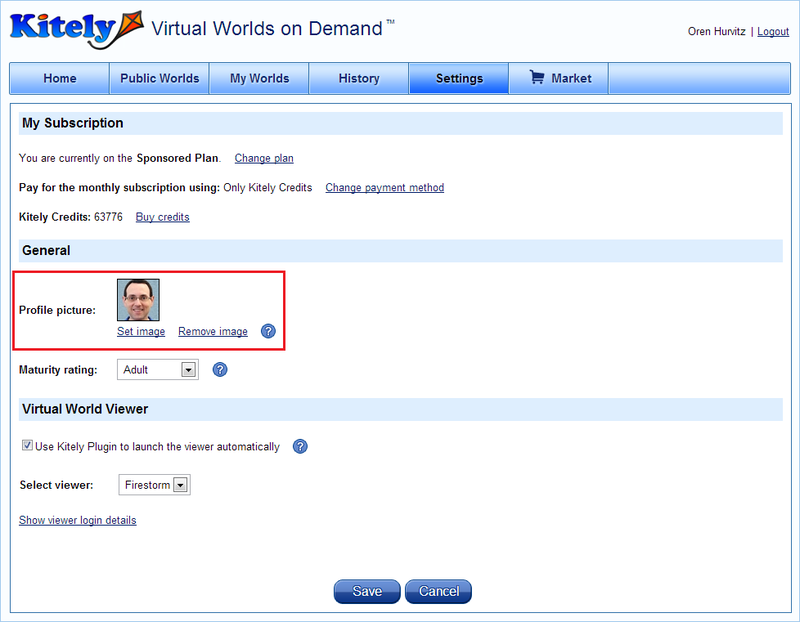 Whenever the user interface shows a user name, this name can be clicked to show more information about the user. 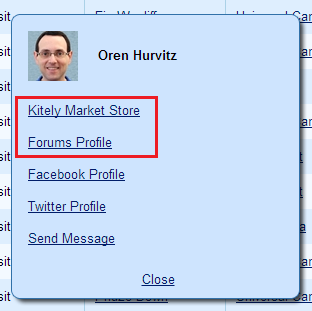 We now include links to the user’s Forums Profile and Kitely Market store (if the user created one). This makes Kitely more social because it enables you to more easily connect to other Kitely users. Kitely Market is a brand new e-commerce platform, and we need your feedback to improve it. Please use this forum thread if you have questions, suggestions or bug reports. 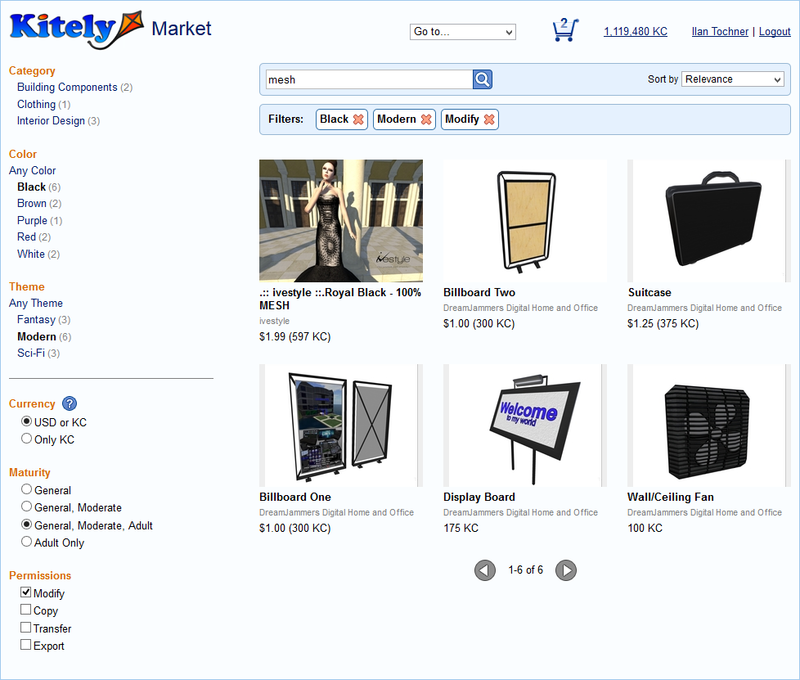 Kitely Market is a virtual goods marketplace that will create a unified market out of the separate grids that make up the Hypergrid metaverse. This will enable content creators to make serious money, while setting up only one store. We’re currently offering incentives to merchants who set up their stores before Kitely Market opens. In addition, the Kitely Welcome Center world (which is currently under construction) will include a billboard ad for your store, and a gateway to your Kitely-based in-world shop (if you set one up). Create a Kitely Market store with a description of your store’s brand, a banner image, and a thumbnail image of your store’s logo. Add at least 100 high quality product listings that adhere to our guidelines. Close variations of the same item (e.g. the same shoes in different colors) will only be counted once. Items that are mostly made up of third-party content will not be counted. Send us an email and request that we review your store for consideration for Featured Merchant status. Normally there’s a fee of 100 KC to add a product to the Kitely Market, and 25 KC to add a variation (Update October 5, 2013: Kitely Market listing fees have been eliminated). However, we are offering a limited-time promotion to encourage merchants to add products now, so that they’ll be ready once the Kitely Market opens for buyers. This means that it would be a good idea to get started on creating products now, before our normal rates kick in. If your first 20 product listings adhere to our guidelines then you may request to be allowed to add an unlimited number of products to your store for free. The link that will allow you to send us this request will appears once you’ve added 20 products to your store. This benefit is unrelated to the Featured Merchants program: anyone can request it. See the Kitely Market Fees page for a complete list of our fees, our payouts, and additional details about this promotion. Please note that there are no fees for uploading content in Kitely: only for listing products in the Kitely Market. Furthermore, if you don’t have a world of your own where you can import or create your products then you can use the free Kitely Merchants Sandbox.